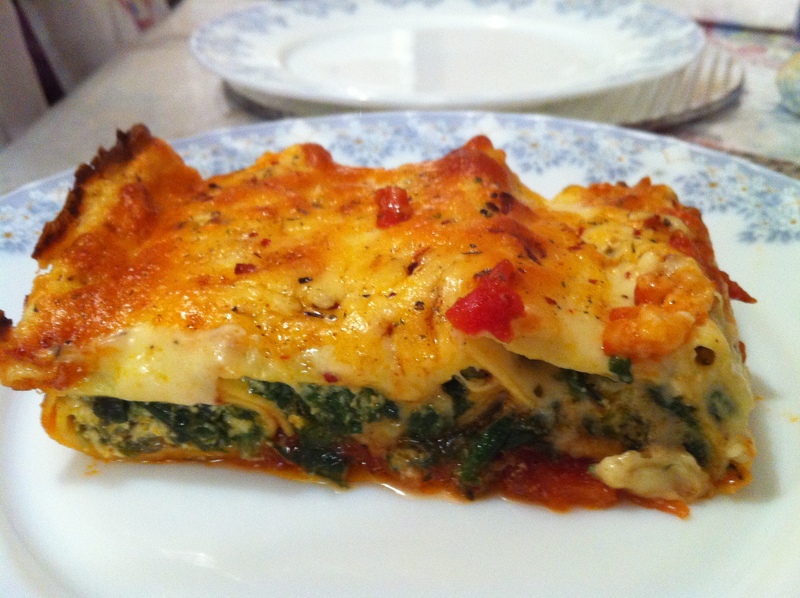 Spinach and Ricotta Cannelloni – Food That Makes You Smile! This is one dish I’m very proud of. My family don’t cook Western dishes, so everything I cook is new to me and an exciting experiment. I tend to base them on a basic recipe I find on the internet, usually the BBC Food website, as well as others. Although there are quite a few procedures to making this dish, you have to trust me when I say it is all so worth it! Even my very own Eastern-food loving mother had second helpings – and that is saying something! For Filling: In a frying pan, heat butter and add garlic, fry until golden, add spinach and let it wilt. Season with nutmeg, salt and pepper. Leave to cool in a bowl. For the Napoli Sauce: Heat oil, add garlic and fry until golden, add onions and cook for 1 minute then add the celery and carrots and fry until slightly brown. 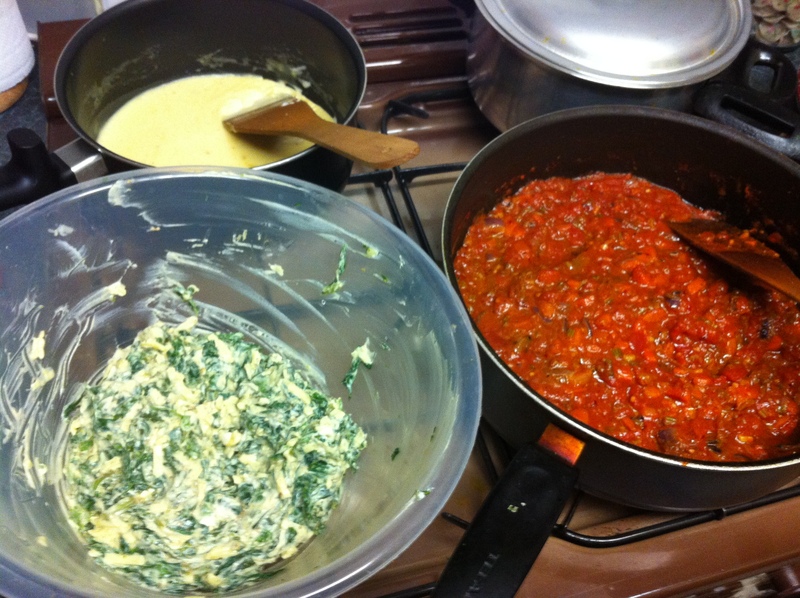 Then add in the tinned chopped tomatoes (if using 2 – rinse the tins with water and add to the mixture). Simmer for 15mins. For Béchamel Sauce: Heat butter, add garlic and fry until golden, stir in the flour to form thick mixture, add milk in parts and stir continuously until it thickens. You do not have to use all the milk. Add the cheese and season. Add a little more salt in this mixture as the milk and flour absorb the taste of the salt. When spinach is cooled, add ricotta and 1 egg and mix in the cheese once combined. Pour the Napoli Sauce into the bottom of a large baking tin, but set some aside if you want to pour some on top. If using large lasagne sheets – follow packet instructions, then cut in half and spoon 1 tbsp of filling to the side and roll up. If using tubes – follow packet instructions, then fill required amount. Place the rolls/tubes on top of the Napoli sauce. Pour the Béchamel sauce on top of the them. If you want, you can add the remaining Napoli sauce to the sides and a little on top. 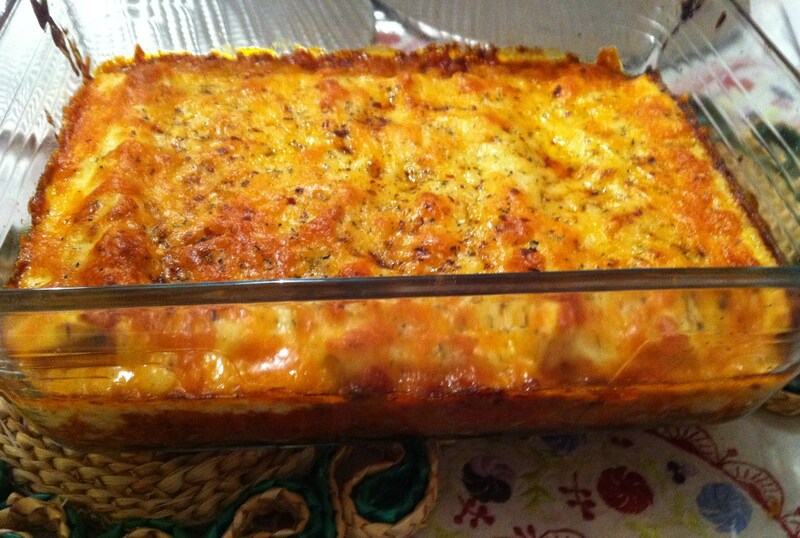 Top with grated cheddar cheese to finish! Cook for approximately 25 minutes (or longer depending on your oven settings) until cheese is golden-brown. 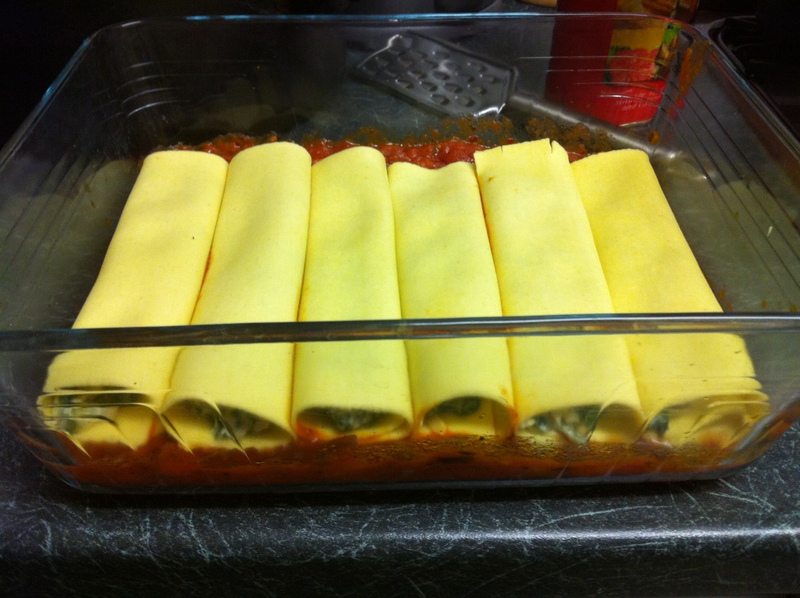 The finished product – Spinach & Ricotta Cannelloni! I like the look of this one! Good pasta dishes are rare, they can often be bland and boring.